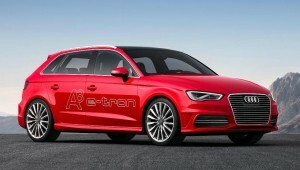 The New Audi A3 E-Tron will deliver 188 mpg! No, you haven’t misread the title for this blog post because Audi’s new A3 e-tron really will deliver 188 mpg and have CO2 emissions of 35g/km. Well, for the Sportback model that is. The new car is due to be unveiled at the Geneva Motor Show and its hybrid engine will deliver a top speed of 81 mph and, in electric mode, have a maximum range of 31 miles. The e-tron should also make people think twice about electric cars or hybrids being too slow for everyday use since this will reach 0-62mph in 7.6 seconds. The Audi is the first to use VW’s new parallel plug-in hybrid system and it will eventually feature in a VW Golf hybrid version set for launch in 2015 (though VW aren’t saying why there is such a delay for what will, inevitably, be a very popular car). The A3b e-tron uses a modified 1.4-litre TFSI unit to help provide the more ‘conventional’ input. A clutch links this to a 75kw electric motor, which is integrated into a newly designed six-speed ‘e-S tronic’ transmission sending power to the front wheels. Combined, the two power units generate 204PS of system power and 350PS of system torque, good for a 0-62mph sprint of 7.6 seconds and a top speed of 138mph. Peak torque from the electric motor is instantly available from rest to around 2000 rpm, and maximum torque from the TFSI engine is on hand between 1,750 and 4,000 rpm. The Audi A3 e-tron can run exclusively on electric power for up to 31 miles at speeds of up to 80mph, which is really quite impressive, or can be powered by petrol combustion alone. Alternatively, the hybrid mode brings both units into play, and the driver can choose to run these simultaneously – a function known as ‘boosting’. When the driver stops accelerating in this mode, both motors temporarily deactivate, eliminating motor braking torque and allowing the car to glide to conserve fuel and recuperate energy. Believe me, this car is going to be popular even though Audi aren’t revealing prices yet. This entry was posted in Eco Car, Electric Cars, Luxury Cars, Manufacturer News, New Cars and tagged audi, audi a3, audi a3 e-tron, car, electric car, electric cars, electric motor, electric power, Geneva Motor Show, LS, MoT, new audi, new Audi A3, price, speed, Sport, Sportback, TFSI, VW, vw golf by Steve Lumley. Bookmark the permalink.